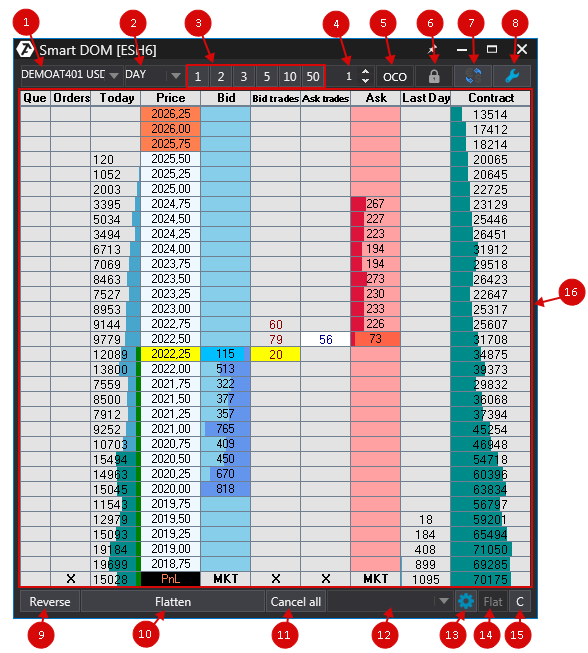 The Smart DOM module is intended for executing trades. The module includes advanced functionality that allows trading using semi-automated protective strategies, sending orders with a single click, and customizing the appearance of the module and its functions according to your needs with the use of the Design mode; this module suits any trading style. 1. Press the Smart DOM hot key. 2. Select Open menu, then open the Smart DOM tab. In this window, select the instrument from the list on the Instruments tab or from the list on the Favorites tab. After the instrument is selected, the DOM window will open. * Please note that not all the available elements are displayed when you load the module for the first time. To view all the available elements, use the “Show all elements” context menu function or the Design mode. 2. Orders duration (DAY- until the end of the trading session; GTC - until manually canceled). 3. Keys for the fast input of the volume of opened positions. 4. Volume - the button for manual configuration of the input volume of opened positions. 5. OCO GROUP - the group of OCO (one cancel other) orders. If several orders are set in the same OCO Group and one of the orders is filled or canceled, the other orders in this group will be automatically canceled. 6. Lock trading - the trade lock button, this option allows avoiding accidental clicks on the DOM. 7. Change Instrument - this button changes the instrument. 8. Settings - this button configures DOM settings. 9. Reverse - reverse the open position at the market price. 10. 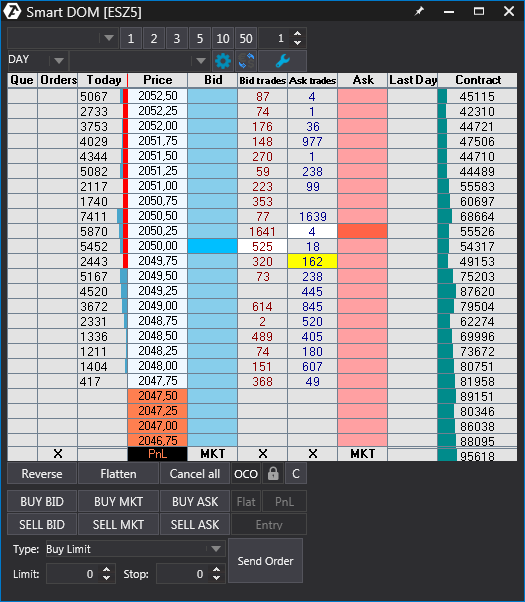 Flatten - close all open positions and orders. 11. Cancel all - cancel all placed orders. 12. Exit Strategy. See details here: Exit Strategy. 13. Strategy settings – setting parameters of the defense strategy. 14. 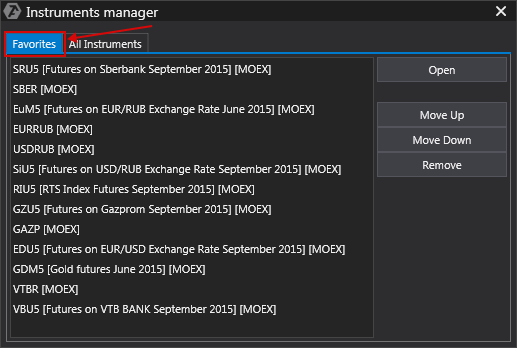 If there are no open positions for this instrument, the FLAT value will be displayed. In case of an open position, this field will display the size and the direction of the position. * The spread can also be centered by double left-clicking on the price column in the DOM. 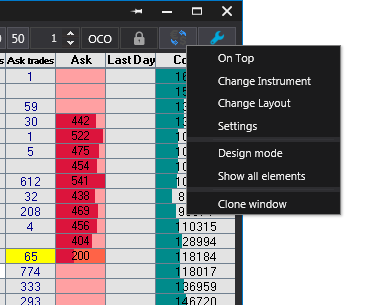 To open the context menu, right-click on any area of the DOM except for trading columns. Change Instrument - this function changes the instrument. * Detailed information can be found here. Change Layout - when this function is selected, the DOM will be moved to the selected layout. * Information about the settings can be viewed here. Design mode - this mode allows customizing the DOM look: the size of buttons, the color of configuration buttons, the content of the text on buttons (text size, color), the location of buttons and DOM columns. Read more here. * This option allows displaying all the available DOM elements. BUY MARKET/SELL MARKET - market buy/sell. BUY BID/SELL BID - setting the buy/sell limit for BestBid. BUY ASK/SELL ASK - setting the buy/sell limit for BestAsk. Type - selection of the pending order type from the list. Limit/Stop –setting the limit/stop price. Send Order - sending the pending order. Clone window - this function is used to copy a DOM.